If you’re trying to lose weight, one major step you’ll want to take is to eat less sugar. All of those sugary treats, sugary beverages, and gooey goodies keep your body in insulin-producing mode, which contributes to the formation of fat cells. The more sugar you consume, the more fat will be stored on your body. The problem is, it’s hard to give up all that sugary goodness! 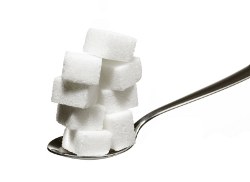 How can you eat less sugar and lose weight without feeling like you’re being deprived? 1 – Eat more protein. Protein takes a lot longer to digest than sugar, so it prevents your body from releasing too much insulin. Protein fills you up and provides energy for your muscles, which helps give your body that lean, sleek look you desire. Do your best to include sources of protein with every meal and snack you eat. Good sources of protein are lean beef, pork, chicken, turkey, fish and seafood. Nuts, seeds, cheese and other dairy products also contain protein, although some of them can be high in fat, so eat them in moderation. 2 – Eat more fruit. Yes, fruit contains sugar too, but it’s a good-for-you sugar. Eating 3-4 servings of fresh fruit each day can dramatically reduce cravings for refined sugar. A “serving” of fruit is one small piece, like a small banana or apple, or half a cup of cubed or chopped fruit like melon. Include a piece of fruit with snacks and meals to help keep your sweet tooth satisfied. Avoid dried fruit and bottled fruit juice, however. These are usually much higher in sugar content and may have the same effect on your body as refined white sugar. Sugar is a mood altering substance and we usually crave it when we feel sad, need comfort, or when our energy levels start dropping. When you take steps to keep yourself feeling happy and uplifted, you’ll find that you need to eat less sugar to boost your mood. Good ways to get happy are doing things you love, spending time with loved ones and friends, taking naps when you feel tired, and practicing positive self-talk. Many people find that simply by eating less sugar, they automatically start losing weight – even if they haven’t made any other changes to their eating habits! Try it yourself and see if it works the same for you.